Sample is a 34 by 39 inch throw in worsted weight cotton yarn, but pattern can be easily adjusted to make any sized blanket. The beginning chain should be a multiple of 32 plus 25. For 34″ width started with chain of 153. (For 41″ width start with chain of 185). (For 48″ width start with chain of 217). After the first row, I recommend stitiching through both the front and back loops of the preceding row. Row 1: Dc in 5th ch from hook (first 4 ch count as dc and ch), skip 3 ch, shell in next ch, skip 3 ch, v-stitch in next ch, skip 1 ch, shell in next chain, skip 1 ch, v-stitch in next chain, skip 3 ch, shell in next ch, skip 3 ch, v-stitch in next chain. ** Skip 5 ch, shell in next chain, skip 5 chains, v-stitch in next chain, skip 3 ch, shell in next ch, skip 3 ch, v-stitch in next ch, skip 1 ch, shell in next chain, skip 1 ch, v-stitch in next chain, skip 3 ch, shell in next ch, skip 3 ch, v-stitch in next chain. ** Repeat across to end. Turn. Row 2: Ch1, sl st in dc, sl st in ch1 sp, ch3 (count as dc), 2dc in same ch1 sp, v-stitch in 3rd dc of next shell, shell in next ch1 sp, v-stitch in 2nd dc of next shell, v-stitch in 4th dc of same shell, shell in next ch1 sp, v-stitch in 3rd dc of next shell. ** Shell in next ch1 sp, skip shell, shell in next ch1 sp, v-stitch in 3rd dc of next shell, shell in next ch1 sp, v-stitch in 2nd dc of next shell, v-stitch in 4th dc of same shell, shell in next ch1 sp, v-stitch in 3rd dc of next shell ** repeat across to last ch1 sp, 3dc in next ch1 sp. Turn. Row 3: Ch1, sl st each of next 4 dc, sl st in ch1 sp, ch3 (count as dc), 2dc in same ch1 sp, v-stitch in 3rd dc of next shell, shell in next ch1 sp, v-stitch in space between two v-stitches, shell in next ch1 sp, v-stitch in 3rd dc of next shell. ** Shell in next ch1 sp, v-stitch in space between two shells, shell in next ch1 sp, v-stitch in 3rd dc of next shell, shell in next ch1 sp, v-stitch in space between two v-stitches, shell in next ch1 sp, v-stitch in 3rd dc of next shell ** repeat across to last ch1 sp and 3dc, 3dc in next ch1 sp. Turn. Row 4: Ch4 (counts at dc and ch), dc in first dc (forms first v-stitch), shell in next ch1 sp, v-stitch in 3rd dc of next shell, shell in space between shell and v-stitch, shell in space between v-stitch and shell, v-stitch in 3rd dc of next shell, shell in next ch1 sp. ** V-stitch in 3rd dc of next shell, skip ch1 sp, v-stitch in 3rd dc of next shell, shell in next ch1 sp, v-stitch in 3rd dc of next shell, shell in space between shell and v-stitch, shell in space between v-stitch and shell, v-stitch in 3rd dc of next shell, shell in next ch1 sp ** repeat across to last 3dc, v-stitch in top of turning chain. Turn. Row 5: Ch1, sl st in dc, sl st in ch, sl st in each of next 4 dc (see note about color changes), ch4 (counts as dc and ch1), dc in same dc (completes a v-stitch), shell in next ch1 sp, v-stitch in 3rd dc of next shell, shell in space between shells, v-stitch in 3rd dc of next shell, shell in next ch1 sp. ** V-stitch in 3rd dc of next shell, shell in space between v-stitches, v-stitch in 3rd dc of next shell, shell in next ch1 sp, v-stitch in 3rd dc of next shell, shell in space between shells, v-stitch in 3rd dc of next shell, shell in next ch1 sp. ** Repeat across to last shell and ch1 sp, v-stitch in 3rd dc of next shell. Turn. Repeat rows 2 through 5 until blanket is desired length. End with a row 4. Finish off and weave in end. The blanket can be made in a solid color or can be made with any number of color changes. For this blanket I recommend making color changes at the beginning of row 5 before the last slip stitch. Cut yarn with a few inches of tail and join with new color next to stitch. Pull new color through to complete the last slip stitch. Weave in ends. GREAT PATTERN. I JUSTLOVE IT. I looked around and couldn’t find that exact pattern. 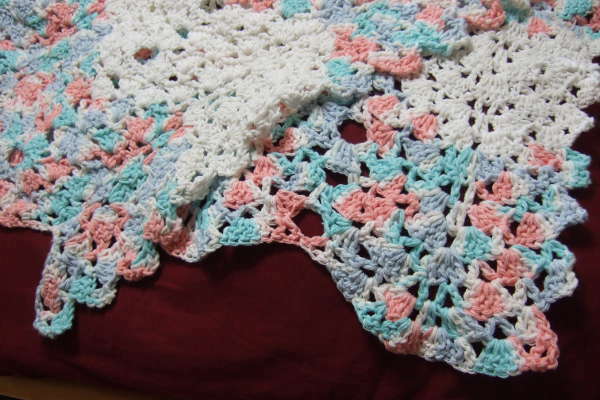 It has some elements of a granny ripple, but then every few rows is a row of double crochet like a traditional ripple. Love this! I can’t follow patterns! Are you going to do a video tutorial for this?? I am having some trouble with Row 3 & Row 5. When I began Row 3, it is staggered & doesn’t line up with the end of row when I sl st over at the beginning of the directions & the same thing happens with Row 5. Could you please tell me what I may be doing wrong that it is not lining up at the beginning of those rows please I began with a chain of 217 as mentioned above. Thank you SO much! I just love this pattern! If I’m understanding what you are describing, it sounds like it is working exactly as designed. Because of the ripple, rows will not always go out to the end of the last row. This picture has a better view of the edge so you can see if that is what yours is doing. Thank you SO much for being so kind & taking the time to send a picture showing the edges close up! And yes, that is what mine looks like I just love your pattern & can’t wait to make it for a friend! Thank you again & for sharing your wonderful talent & your beautiful work with all of us to enjoy! I’m really interesting in learning what brand/colors of yarn you used in the shell/v-stitch afghan pictured here. The ombre colors of blues & corals are colors I know my sister would love. I don’t know if this is still available because I’m pretty sure I bought it many years ago. It is Lily Sugar’n Cream Ombres & Prints and the color is 130 Shaded Pastels. Help Is it correct in row 2 that in the repeat section that you have to Shell in Ch1 space and then, skip shell, and then shell in next ch1 space. My work is starting to curl when I do this. Any suggestions. This is correct because that forms the “valley” for that row. With ripple lace patterns, it takes several rows before the ripple pattern is firmly established, so it can look like it isn’t going to lay flat at first, but should work out after several rows. Can you tell me how to get a print version of this pattern. 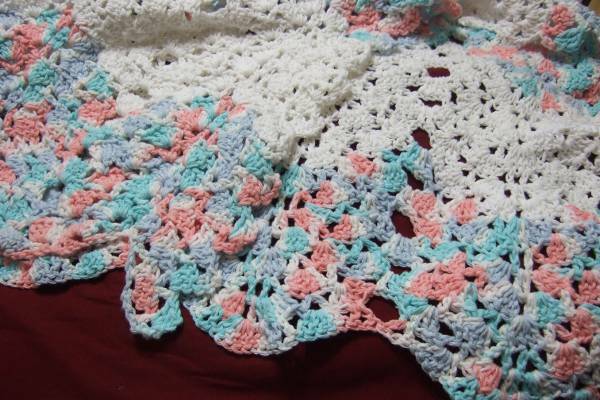 I am so anxious to try this as it looks like what I am looking for, even tho’ I have never crocheted with cotton. There is a printer icon at the top of the pattern that you can use to get a print-ready version of the pattern. Beautiful stitch. Wish you had a video of this pattern. Your videos help so much. keep up the good work love all your patterns. I added that one to my list. School is out, so I’ve started recording videos. I hope to get all of the requested ones done before school starts again in August. I have tried this pattern and riped it out about 6 times. I understand the ripple on the one side but the other end comes out straight and even. Am I doing something wrong? The beginning edge will not have the exaggerated ripple of the ending edge. The ripple is different from the zig-zag style ripples that are identical on the two ends. I want to thank you for writing out your instructions so succinctly. They are very easy to follow and the afghan is turning out beautifully!!! Merry Christmas!!! I am beginning the 2nd row. The pattern says slip stitch in D.C. Which D.C. Do you do this in? You end row 1 with a v-stitch. Ch 1 and turn to work back in the reverse order of row one, so the first thing to work over is that last v-stitch of row one. Slip stitch in the first dc of that v-stitch, then slip stitch in the ch-1 space of that v-stitch. The row two repeat ( ** Shell in next ch1 sp, skip shell, shell in next ch1 sp, v-stitch in 3rd dc of next shell, shell in next ch1 sp, v-stitch in 2nd dc of next shell, v-stitch in 4th dc of same shell, shell in next ch1 sp, v-stitch in 3rd dc of next shell **) produces this pattern: shell, shell, v-stitch, shell, v-stitch, v-stitch, shell, v-stitch. So for the most part there are alternating shells and v-stitches and shells, but within each repeat there are a pair of shells together and a pair of v-stitches together. In the Row 3 repeat (** Shell in next ch1 sp, v-stitch in space between two shells, shell in next ch1 sp, v-stitch in 3rd dc of next shell, shell in next ch1 sp, v-stitch in space between two v-stitches, shell in next ch1 sp, v-stitch in 3rd dc of next shell **) the first shell is made in the v-stitch that is before the pair of shells, a v-stitch is made in the space in the pair of shells, a shell is made in the next v-stitch, a v-stitch is made in the center stitch of the next shell, a shell is made in the first of the pair of v-stitches, a v-stitch is made in the space between the v-stitches, a shell is made in the second of the pair of v-stitches, and a v-stitch is made in the center of the next shell.